I've always been one who "collects" purse patterns but have yet to make one. I have all the add-ons (handles, snaps, clips) necessary to finish a purse as well. When I saw the Reversible Purse pattern on the Moda Bake Shop, I knew I wanted to try it. 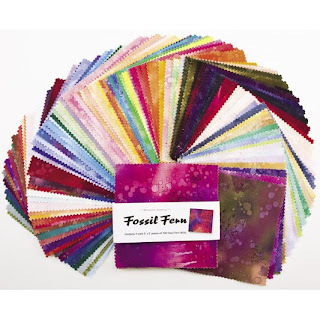 I had a 100 pack of 5" squares previously purchased called Fossil Fern Charm pack. 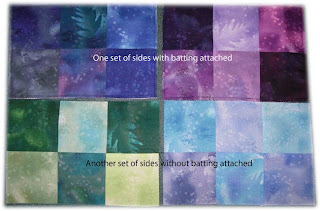 Here's the panels I created for the reversible purse. Darks for one side and lighter colors for the reverse side. So far, So good. Here's the range of colors in the fossil fern 100 pack. If I use my extra handles, I might just be able to make a few purses from this pack. My problem with purse patterns are that I sit there and over analyze each step and convince myself into saying that it's too hard. So, I'm determined to finish this one. If you know of any easy purse patterns out there, send them my way! OK, I am soooooo envious of your fossil fern charms!! Love them! That purse is going to be drop dead I tell you! I absolutely love your fabric - very very pretty and just in time for Spring !